There is some news making the rounds that Earth is not the only planet experiencing global warming. Mars, for example, possibly appears to be getting a bit warmer, as are Jupiter, Neptune’s moon Triton, and even Pluto. Could this mean that global warming is caused by the Sun and not man’s pollution? I am certainly seeing global warming deniers and others taking this information and running with it (like here, for example, or here, and on Benny Peiser’s CCNet on March 7, 2007, though I don’t have a link for that). However, let’s take a skeptical approach shall we? First off, I want to make a very big point here: the changes in the Earth due to global warming, while real, are somewhat subtle. Yet the Earth gets most of its heat from the Sun, so if the Sun were the cause, we’d expect the effects of warming to be much stronger on Earth than any outer planets. So any really strong signal of global warming on outer planets like Jupiter or especially Pluto, if real, are very unlikely to be due to the Sun. Second, what I am seeing in these arguments is a very dangerous practice called “cherry picking”; selectively picking out data that support your argument and ignoring contrary evidence. It certainly looks interesting that Earth, Mars, Jupiter, Triton, and Pluto are warming, and if that’s all you heard then it seems logical to think maybe the Sun is the cause. But they aren’t the only objects in the solar system. What about Mercury, Venus, Saturn, Uranus… and if you include Triton to support your case, you’d better also take a good look at the nearly 100 other sizable moons in the solar system. Are they warming too? I have heard nothing about them in these arguments, and I suspect it’s because there’s not much to say. If they are not warming, then deniers won’t mention them, and scientists won’t report it because there is nothing to report (“News flash: Phobos still the same temperature!” is unlikely to get into Planetary Science journals). However, I can’t say that with conviction, because the absence of evidence is not evidence of absence. Any planetary scientists reading this blog entry, please contact me. I’m interested in hearing more. Mars: To start, is Mars even warming globally at all? Perhaps not – it might be a local effect. And if it is global, there already is an idea of why that might be happening: it would be due to periodic changes in its orbit, called Milankovitch cycles. The Earth has them too, and they do affect our climate. And the guy who is proposing that the Sun is warming Mars doesn’t think CO2 is a greenhouse gas. I think his science is a little suspect. His reasoning is certainly specious– he says if Mars and Earth are both warming, it must be due to the Sun. As I point out above, that is clearly not necessarily the case. Even if this martian warming turns out to be true, it may just be a natural effect of the shape of the orbit of Mars. 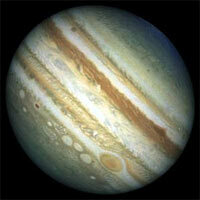 Jupiter: The evidence for Jupiter’s global warming is nothing of the sort. It is evidence that there are warm spots, with storms rising to the tops of the clouds. This may just be a local effect, and not global. Jupiter’s atmosphere is fiendishly complex, and not well understood. If you’ve ever looked at the planet through a telescope, you can clearly see thick horizontal bands across the disk; these are enormous wind patterns that dwarf the Earth. A few years ago, one of the dark bands disappeared completely. For reasons unknown to this day, it sank a bit in the atmosphere, and opaque clouds covered it up. I saw it many times through my ‘scope, and it was bizarre. Then, after a while, it reappeared, just like that. My point: any claims about Jupiter’s atmosphere when it comes to global warming must be approached very carefully. We don’t understand the dynamics of that system. Also, Jupiter’s atmospheric physics is dominated by the internal heat of the planet, and not by the heat from the Sun. So even if the Sun did heat up somehow, the effect on Jupiter would probably be a lot less dramatic than here on Earth. Triton: With Triton, Neptune’s moon, it says in the very article quoted that Triton is approaching an extreme summer season, due to the tilt of its orbit. This happens every few centuries. So the Sun can be constantly chugging away, and Triton would warm up anyhow. Mind you, Neptune’s orbit is 165 years long, so we haven’t even observed it for a full orbit since the invention of modern detectors capable of giving us good data. Therefore it’s very difficult, if not impossible, to distinguish between factors like the Sun warming up Triton anomalously, or just the usual changes in the moon due to seasons. Pluto: As for tiny Pluto, its dynamics are very poorly understood. What we do see is that its atmosphere appears to be thicker than expected right now. Pluto doesn’t have much of an air blanket, and it changes over the course of Pluto’s orbit as the tiny iceball approaches and recedes from the Sun. Pluto reached perihelion, the closest point in its orbit to the Sun, in 1989, and is slowly drawing away again. You might think its atmosphere would start freezing out, getting thinner. But that’s not happening; it’s getting quite a bit thicker. However, this is not totally unexpected. Changes are not instantaneous, and it may take a while for things to thaw. It’s possible that only now are gases frozen on Pluto’s surface starting to evaporate. It’s a weird planet, tipped way over (Earth is tilted 23 degrees, while Pluto is canted at 122), and the orbit is highly elliptical and tilted, too. You expect weird stuff from it, and a delay in the thawing is not all that surprising. Plus, let’s think about this: Pluto is more than 30 times farther away from the Sun than the Earth is. If the Sun were warming up enough to affect Pluto at that vast distance, it would blowtorch the Earth. If the effects of Earth’s global warming are subtle enough to argue about at all, then it’s safe to assume the changes on Pluto are completely irrelevant to the argument. So where does that leave us? When I look at all of this, I see a handful of the 100 large solar system bodies showing some evidence of local warming (Jupiter’s spot), some evidence of systemic warming with known causes that are a lot more likely than the Sun heating up (like well-understood orbital variations), and some evidence that any warming experienced by these bodies is possibly being exaggerated in the reporting. I also see cherry-picking, with no mention of the other planets and moons in the solar system. And what of the Sun? Is it possible that the Earth’s warming is caused by our nearest star? Of course it’s possible. There are links to the Sun’s behavior and Earth’s climate (look up the Maunder minimum for some interesting reading), and it would be foolish to simply deny this. However, this is a vastly complex and difficult system to understand, and simply claiming “Yes it’s due to the Sun” or “No it’s not due to the Sun” is certainly naive. 1) The Earth is getting warmer. 2) We are dumping more CO2 and other greenhouse gases into the atmosphere. 3) A little greenhouse effect is a good thing (otherwise the average temperature of the Earth would be below the freezing point of water). Too much, however, is Venus. 4) Some of this global warming is due to human causes. This is fact. The question is, how much? 5) There are political and ideological ramifications of global warming, and a lot of people – politicians, in fact – have a lot at stake and are known to twist science to meet their needs. With all of these facts lined up, it’s clear that the one thing we need to do is be very, very careful when someone comes in and makes a broad, sweeping statement about global warming’s cause, especially when they have ulterior motives for saying what they do. This may sound like an ad hominem, but we have seen, over and over, how science gets abused these past few years by those in power. A jaundiced eye is critical in science, and a little skepticism – or in this case, a lot – is a good thing. Fire image courtesy of home-and-garden.webshots.com. Mars and Jupiter images from Hubble.